We launched a Facebook app with SS+K for Allstate Insurance called DSGN8D TXTR and serves a very worthwhile and important purpose: encouraging teens (and everyone else) to never text while driving. 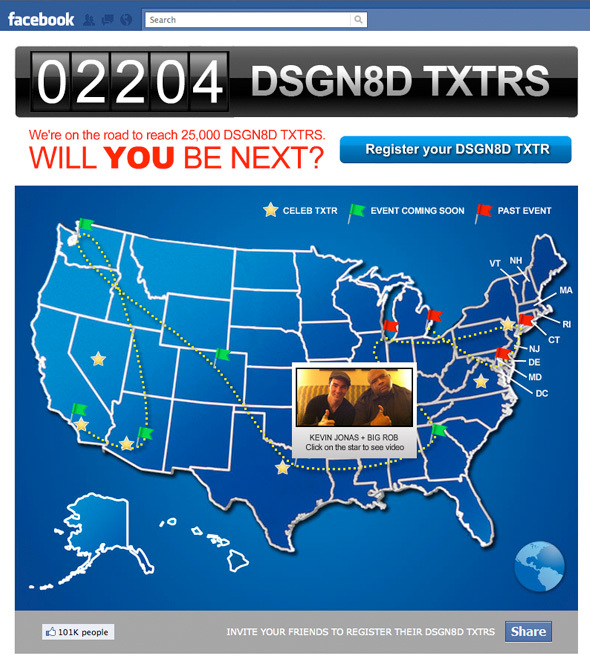 The goal is to register 25,000 DSGN8D TXTRs via the Facebook app and through live events around the country. Solarsilk’s custom CMS accepted registrations via the Facebook app and allowed Allstate to update live event registration numbers, define Facebook photo albums associated with the events, and more.